Mendunjanin passed one slab, known as a weft, through the warp, stationary longitudinal threads held in tension on the loom, then the other, interlacing gray and black yarns as Bridgeport-based weaver Ruben Marroquin looked on, smiling, occasionally correcting the child’s technique. “It’s quite interesting,” Medunjanin, 9, said, of his work at the loom. 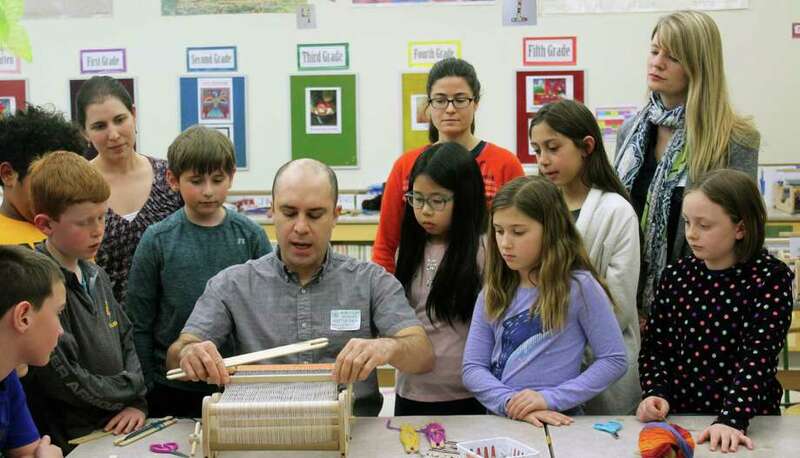 This was Mendunjanin’s second year receiving weaving instruction, and the second year that Marroquin, with his friend, collaborator and fellow Bridgeport artist Liz Squillace, had come to McKinley over the course of roughly a week to work with every student in the school on weaving. “We brought them back this year, and now they (the students) can build upon the skills that they’re comfortable with from last year,” said Sally Connolly, a McKinley parent and the director of cultural arts at the school. It was she who arranged the workshops with Marroquin and Squillace. In addition to explaining the importance of labeling one’s work, Mendunjanin was showing off one of these newly acquired skills: a double weave, using two wefts. Others in the class were working at varied paces. Ava Barahona, 9, and Aubrey Olaciregui, 10, were working with more colorful patterns of pink and purple, raising and lowering the heddle, which controls the threads in the warp and allows the weft to pass through. “It’s easy and fun,” said Barahona, 9, who also participated in the workshop last year and gave her woven rectangular creation as a gift to her mother. Marroquin, like his Fairfield students, has been weaving since he was a child in Venezuela, starting with interlaced paper strips he’d cut with an exacto-knife, inspired by an exhibit of work by the artist Gego, who was also Venezuelan. He studied art in his home country and then came to New York to study at the Fashion Institute of Technology, choosing to focus on textile design. While in New York, he began travelling to Connecticut to display his work, thanks to a friend involved in the Bridgeport art scene. It was at the Bridgeport Art Festival that Marroquin met Squillace, who operates her own Arcade Mall studio, nearby Marroquin’s, called Paradox Ink, out of which she makes her paintings and screen prints. “He taught me how to weave and he kept coming back to Bridgeport so we started doing collaborations together,” Squillace said. Connolly, too, was introduced to the pair’s work at the annual art fest and, beginning in 2017, asked that they bring their craft to McKinley. “It’s nice for the students to have exposure to diversity in the arts,” Connolly said. Around the room, Mendunjanin, Barhona, Olaciregui and the others were working diligently weaving their patterns.